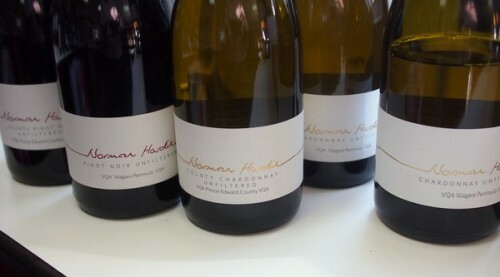 I visited Norman Hardie in Prince Edward County in 2013, and was blown away by the wines he’s making. So it was great to be able to taste his latest releases at The Wine Society’s HQ in Stevenage yesterday, courtesy of buyer Sarah Knowles. I also tried a couple of the 2012s that they are currently listing. These are really intriguing, elegant wines. He makes a pair of each Pinot Noir and Chardonnay, from both PEC and also Niagara. The different climates (Niagara is slightly warmer, and can be quite humid during the growing season) are evident in the wines. Thank you, Jamie, for this timely post. Niagara PNs generally have little to offer my clay palate, with the exception of those made by Francois Morissette and Norman Hardie. Since LCBO generally doesn’t offer the County Pinots in their stores, I shall make the drive to PEC when I am in Ontario next month. Prince Edward County also offers the bonus of being one of the prettiest areas in the province. One cannot go wrong with Norman Hardie.